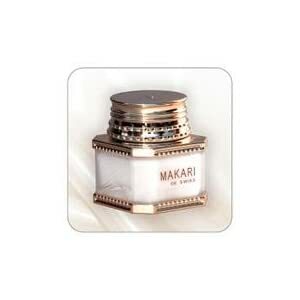 The MAKARI Caviar Face Lightening silky, pleasantly scented cream, revitalizes and restores major skin functions and prevents the appearance of premature expression lines. Your facial skin will soon be visibly lighter, finer and firmer. With its unique caviar ingredient, this cream evens out the skin tone, fades blemishes and creates a luminous complexion. Recommended for dry skin types only. Hi! Does this really work? I am in my mid-20s and I’m exploring options to keep my skin fair. I am currently using Diana Stalder products that I got from southgain-skin-care.com and I’m really happy about them. Just wondering if it’s comparable. Thanks! I only recommend products to my friends that have worked for me & not based on what other people say. I tried this one with the Makari whitening pills & the pills worked for my body & this cream helped a lot making my face lighter and even-toned. I can now go out without make up on sometimes and I’d say this is worth it, instead of buying costly make up to cover the uneven skin tone I’ve always had. I am an Asian woman who has had problems with melasma and brown spots due to sun exposure for a number of years. A large area of my face was affected. I have been using Makari for a month and a half or so and the dark areas are much, much lighter. I may be imagining things, but it seems the wrinkles around my eyes are less noticeable, as well. Overall my skin looks great. I have been getting more rest and exercise these days, so that might be a contributing factor to my looking more youthful, but those embarssing dark areas on my face are definitely significantly lighter. I was lucky not to suffer any acne breakouts, either. This product worked for me in 2 weeks and it is just big change and difference. It really works …I have no zit or pimples for now and am fine with the product. I will come back to update the product. I am truly amazed at this product. Not only does it work, but it works fast. I started noticing a difference the first week with regards to skin clarity, pore refinement and suppleness. After ONE WEEK, I’m having to scale back on my applications from twice a day to once a day. The only cons are the products contains fragrance (reconsider if you have scent sensitivities) and the containers are glass (very pretty) which makes for heavy traveling. Otherwise, I have no complaints.